There’s a doctor in the house. Salina has a new mayor, and it’s Dr. Trent Davis. Davis, who has served as the vice mayor for the past year, is the new Mayor of Salina. Taking his spot as vice mayor is commissioner Mike Hoppock. Dr. Davis takes the gavel as mayor from Karl Ryan, who will still sit on the commission. Ryan reflected on his year as mayor. After being handed the gavel the new mayor also spoke. Davis talked about what the city commission has accomplished over the past couple of years, and looked to the future as well. Dr. Davis is just the second African-American mayor in the history of Salina, following in the steps of Robert Caldwell who served two terms as mayor, from 1970 – 1972 and again from 1975 – 1976. The City of Salina Commission reorganized this evening. Congrats to Dr. Trent Davis, who is now the second African American Mayor in the history of Salina, following in the steps of Robert Caldwell. 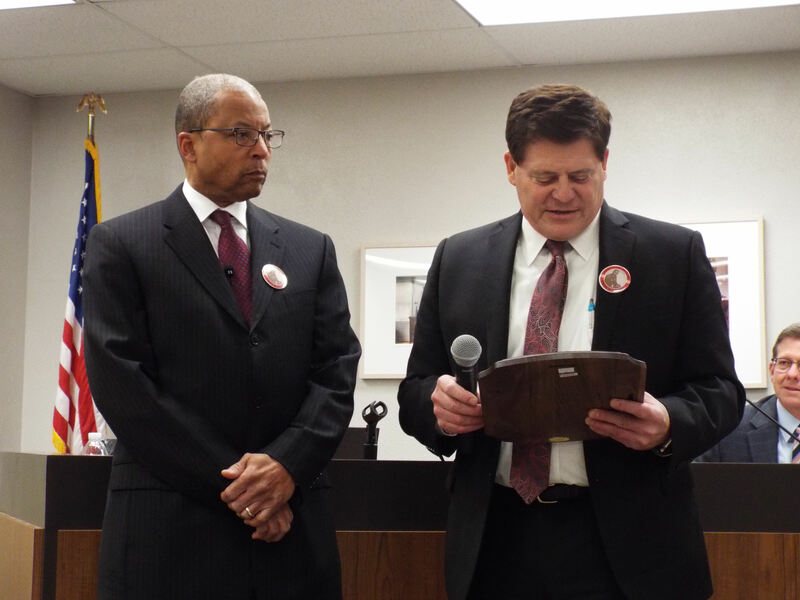 Outgoing mayor Karl Ryan awards a plaque to new Salina Mayor Dr. Trent Davis.